My trip to Paris at the end of May this year didn’t offer any good weather. It was mostly cold and rainy each day. 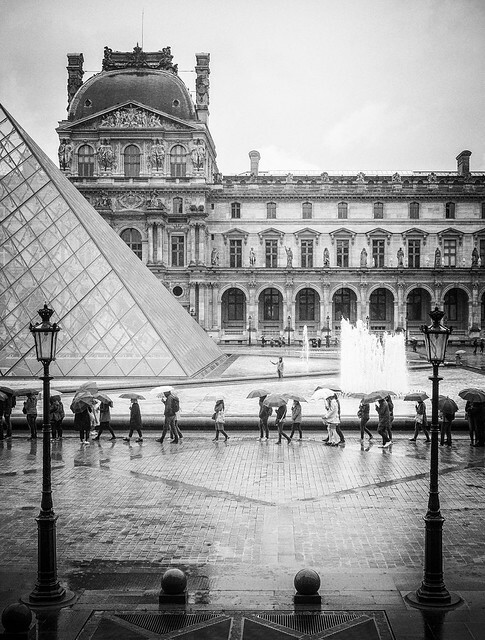 On the rainiest day I decided to spend some hours at the Louvre. Had only been there once before. And at that time only had an hour before I needed to leave for the airport. This time I could use the whole day if I wanted. What I mostly wanted to see was the section with french and italian painters. I was there at my first visit, but felt that I had to little time then. This time I wanted to be able to take the time I wanted and look at all the magnificent paintings. I wasn’t bothered with lack of time this visit. Which was nice. Although it was hard to concentrate on the paintings since almost everyone it running around taking pictures of the paintings instead of looking at them. So wherever you stood, you was in the way for someone taking a picture with their phone or iPad. There was a lot of people at the Louvre that day and long lines to get in. Below is a view out from one of the windows in the Louvre.